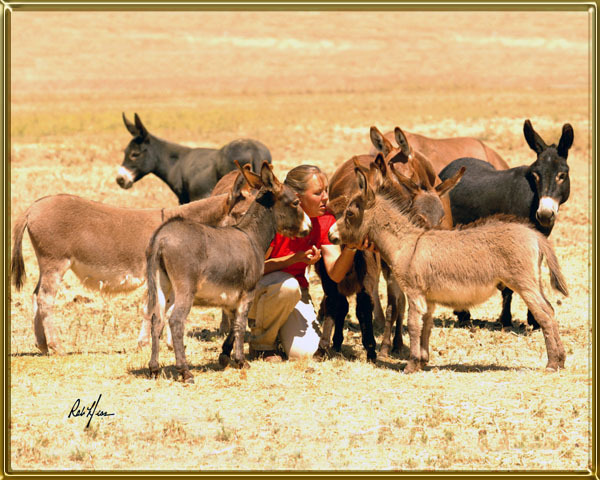 There are often times when I need to quickly evaluate the conformation of a donkey, such as when I travel, at a sale, or at a show. These donkeys may be out in a field wearing their winter shaggy coat or show clipped, in hand or at liberty. A good deal of the time I quietly make a judgment about the donkey while I am in conversation with it’s owner. I have created a system of studying a donkey that works for me. There are LOTS of excellent books written that can teach the intricacies of conformation; my system is a cursory evaluation only. I find that it helps me to evaluate conformation when I do it in an organized fashion. The first thing I look at is the head. I want to see a big soft eye, and an appropriate length of head with a lot of character. A beautiful head is very important to me so if the donkey doesn’t have one my consideration of it is concluded. Next I look at the hooves. I will not purchase a club footed donkey and I check the hoof for the rings around it and shape that can suggest the donkey has been foundered. Then I check the donkey’s bite. This is easy to do with one finger while I snuggle the donkey’s head and I can usually accomplish this unnoticed by the owner thereby avoiding offending him/ her. I will not purchase a donkey for breeding with a bite off more than 1/8th inch. Quite a lot of the donkeys I look at do not pass these first criteria but if he/she has I continue by studying the donkey from the side. I am looking for balance. I want to see thirds: the chest, mid-section, and hip should all be of about the same proportion, and look like they all should belong to the same animal! Some donkeys look like they could tip forward with slight provocation because the chest is big, the neck thick, and the head big while the hindquarter is slight. If you divide this donkey in thirds you will find that her hindquarters belong on a different donkey. She is very out of balance and I would not want her in my breeding program. 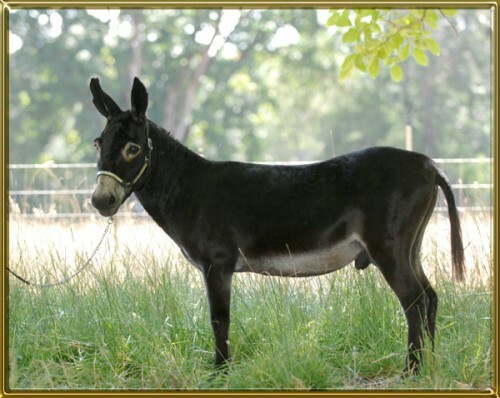 The donkey should have about the same depth of body as it has leg, however the desirability of this can depend on the proposed use of this animal. A performance donkey can move better with long legs and a longer mid-section comparatively. Motown is 20+ years old in this photo. The donkey pictured above is Little Motown of Circle. He is a classic performance donkey because of his long neck, high tie in, long back. and long legs. He can really move and is beautiful doing it. 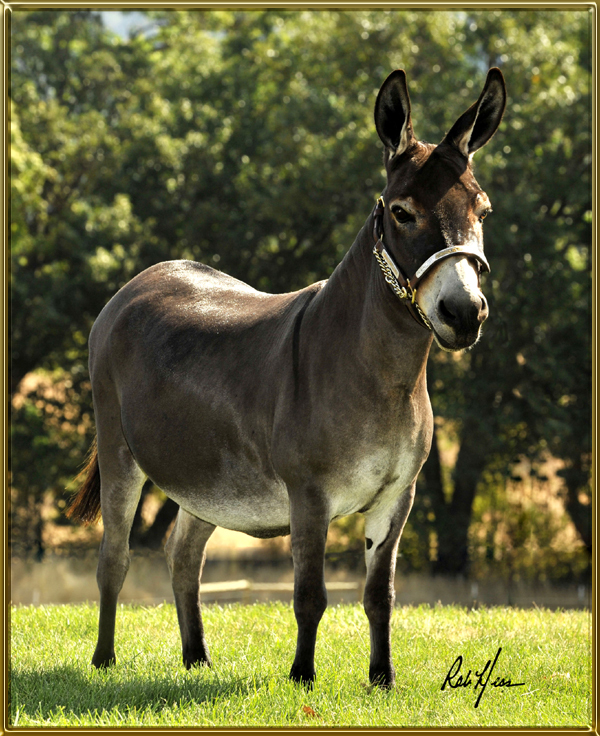 The donkey pictured below is Circle C Silverado. 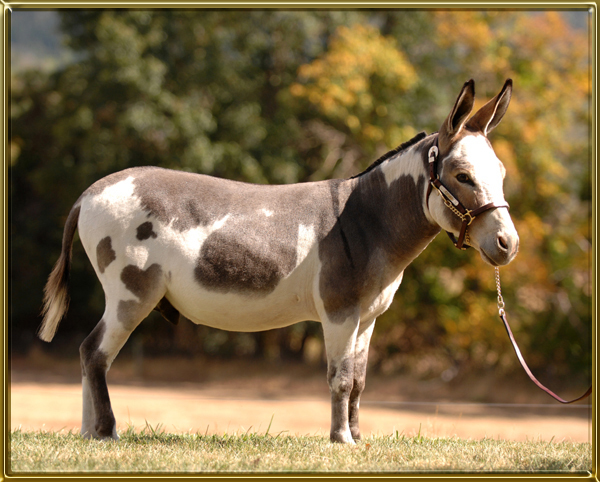 He is a perfect example of a draft type donkey because of his width, his compact body and shorter neck. Both of these donkeys have been show Champions and produced Champions. In a breeding situation they are used very differently. So, back to my story. If the donkey has passed the criteria so far he is worth a little more of my time. Now I look for a fine throatlatch, an appropriate length of neck, a high tie-in of the neck at the shoulder and good definition of where the neck ends and the shoulder begins. This is especially important for a driving donkey because a short, thick neck with a low tie-in impedes movement. The donkey above is Circle C Legend. He has a nice throatlatch in that his neck tapers nicely and you can easily see where his neck ends and his head begins. His neck meets his shoulder up high and with good definition. The donkey above is BR Pepper Jack. Pepper has a nice nearly level top line with a very strong connection at his loin. He also has a well shaped hip and has good balance overall. His parts fit! he does not tuck up well in the flank area and that will impede his movement. He is a draft type jack so I can live with that. 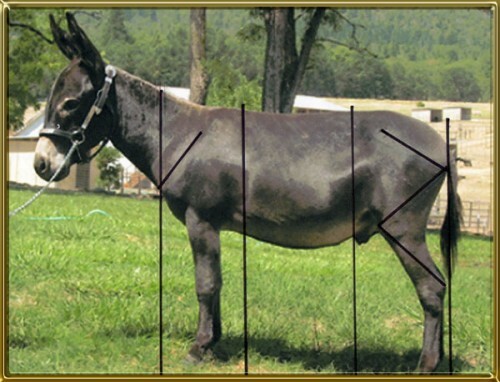 When I look at the midsection of the donkey I would like to see a level top line with a strong loin. I also want to see the donkey tuck up a bit in the flank area. Again, thickness here impedes movement. I love a deep hip! When I look at the hip of a donkey I consider the length of the hip as well as it’s shape. I want to see an equal triangle of the knobby hip bone, the bone just below the tail, and the stifle. If I see this or close to it I continue. 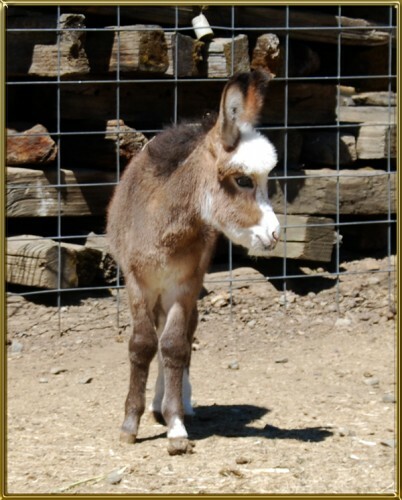 This weanling donkey has a narrow chest and crooked legs. He is pretty straight to his knees but at that point his legs go off. He also toes out on both front feet. There are times in a young donkey’s growth when the legs will be off at the knee and then come back in later. That is because the growth plates in the knees sometimes don’t develop evenly. The situation many time will correct it’s self without an owner being aware of it. I go to the front of the donkey and study the width of it’s chest and the quality of the front legs. What legs can show could be an article in itself but for my purpose here this is what I do. I picture a straight line drawn from the center of the front legs as they come out of the chest and through the knee, pastern and hoof. I hope to see as little deviation from this bisection as possible and it is up to me to decide how much deviation I am willing to tolerate. This beautiful jennet is Circle C Cappachino. She has great legs and good width of body. While I am at the front of the donkey I also look back across the top of the rump and off across the top of the tail. A good quality donkey will be round across the top of his rump; a poor quality donkey will have a steep angle from the spine and down to it’s sides. The donkey below has a very poor hip from this angle. She is very narrow at the tail and steep off the sides. This is a big fault. Now I go to the back of the donkey and look at the width between it’s legs. The width should be the same for both the front legs and hind legs. Then I mentally draw the same straight line as I did for the front legs. Again, it is for me to decide how much deviation I am comfortable with. I also look at the point of the hip bones to the two small bony knobs on each side of the tail and draw a visual straight line between them. I want this to be a wide angle because a narrow opening at the pelvis is a problem for safe foaling, and it is not as strong functionally.If you go back up and look at several of the donkeys I have used as examples you can see good with front and back. This concludes my cursorily evaluation but not my decision about purchase. 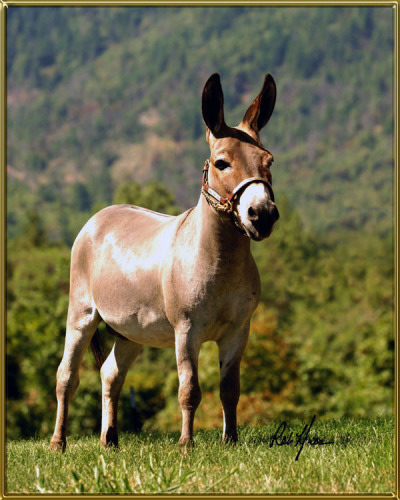 Now I will consider the pedigree of this donkey and how it will mesh in my herd. There are often many ways to do things right so please remember this is just what works for me. I hope it will help you too! I am absolutely fascinated by the study of equine conformation. I have read oodles of books on the subject and have even paid professionals to come to my ranch and teach me using my own animals. All of this has been really helpful but it is possible to take things one step further. Have you ever looked at a horse, or other kind of equine, and had the person next to you say “Look how out of balance he is!” or “Well, his hip angle is all wrong”. You are both looking at the same animal but may not see the same things because you have to know where to look and know what “ideal” is. Studying photos has really helped me educate my eye. Some of the study of conformation is subjective but most of it, really, is bones. I have found that looking at an equine in person and seeing what I think I see and then going to a good photo of him and proving it one way or the other is helpful in my education. Notice that I said “good” photo. Taking good equine photos is a learned skill. Bad photos are out there all over the place but it is easy to take good ones and this is how. The first thing the lens comes to will appear larger than all the rest. This is a key point. If you stand at an animal’s head and take the photo the head will appear to be huge in relation to the body. This kind of distortion can make it very difficult to find value in the rest of the photo as far as our study goes. The camera must be level with the vertical center of your subject. If you look down at your photo subject the photo will be distorted. Further, you can make a good equine look bad or a poor specimen look better based on how the photo is set up. 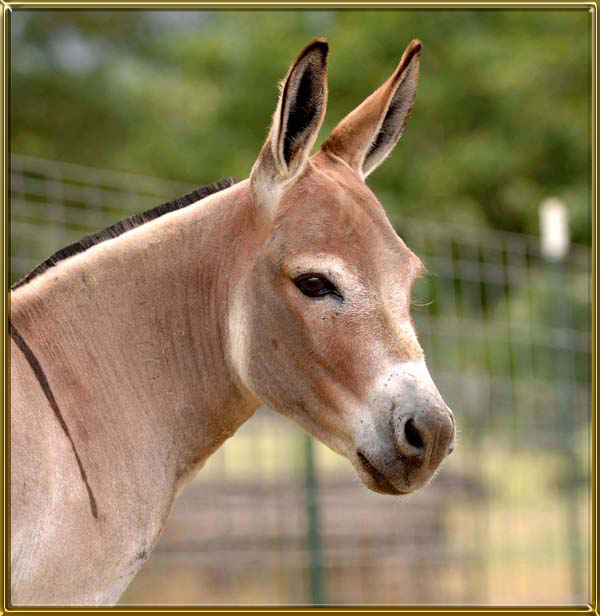 For instance, when I take a photo for marketing purposes of a donkey with slight hindquarters I will stand at the side view of him, have my camera level and centered to the photo, and I will position myself slightly closer to the hindquarter than the shoulder. This will change his balance in the photo and improve the look of his hip. For our purposes a photo does not need to be perfect but it is helpful to understand the angle of the camera so you know if distortion exists. I use a side view photo with a level centered camera angle to begin. The first thing I access is balance. I draw perpendicular lines; one at the front of his chest, one just where your cinch would be, one where the loin joins the back, and the last line is drawn from the outside of the hindquarter. Then I measure: from my first line to my second line, from my second line to my third, and from my third line to the outside hindquarter. Then I use a ruler to check if my visual assessment of this animal was correct. This will tell me if the back is too long and if the three segments are the same length. I draw lines to measure the angles in the hip, correctness of legs front and back, shoulder angle, legs from the side view, and there are several more ways to use this tool than I have talked about here. Over the years doing this has really helped train my eye. I always evaluate the animal in the photo per my visual judgment, and then I check to see how correct I was in my evaluation by using the lines drawn on the photo. It has helped me be much faster at evaluations as well and this really helps when I am out in the field looking at someone else’s donkeys. The other thing that I have found important is to give language to what I see. I can look at a donkey and say I like him or I don’t; but why? It has helped train my eye to be able to know that it is because his back is too long, or his shoulder is short and a bad angle, his hind legs are camped out, his gaskin is too long, etc. It is also a help when I try to talk to someone about this animal. My friend knows what exactly I am looking at and it helps me to sound a bit intelligent. I believe the study of conformation may be a lifelong challenge and I look forward to it. Over the years I have gone from understanding the big picture characteristics, like being out of balance, to being able to recognize the finer point of where in a leg a deviation originates. This has helped me immensely in selecting breeding combinations and has resulted in increasingly good quality foals. I find the whole process quite rewarding. I hope you will too!